This group of terracotta figures, which Vasari claimed was the most famous work of art in the entire city of Bologna at the time of its completion in 1522, depicts a relatively common subject from the life of the Virgin, her burial, with some unusual elements. 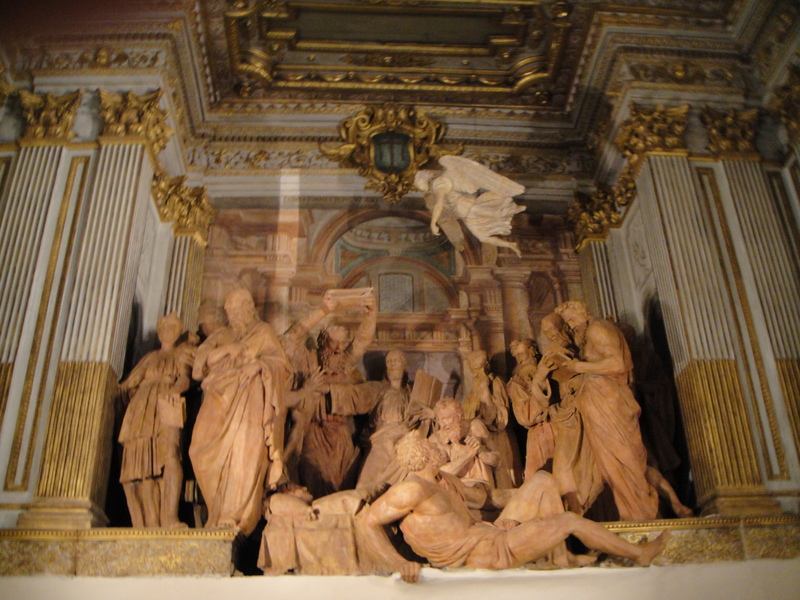 The sculptor, Alfonso Lombardi, gives a central position to an apocryphal figure, the Jew Ananias, who in several retellings attempted to overturn the casket and was struck down by an angel. Though it is not represented in the sculpture, the story concludes with Ananias’ conversion to Christianity. This dramatic sculpture with a strong anti-Jewish subtext was placed in the heart of one of the largest and wealthiest cities in the Papal States at a time when its Jewish bankers were competing for control of the city’s lending with monti di pietà (charitable lending operations) run by the mendicant orders. In later decades, after a series of laws issued by Paul IV, Pius V, and Clement VIII drastically limited the conditions under which Jews in the Papal States were forced to live, the Jews of Bologna were enclosed in a ghetto, expelled, and re-admitted, while a casa dei catecumeni founded in the 1560s offered the only real possibility of escape from marginalization, poverty, and religious persecution- conversion to Christianity through a process of isolation from the Jewish community, gradual introduction to the precepts of Christianity, and finally, baptism. This entry was posted in Art objects, Case studies and tagged Peter Mazur. Bookmark the permalink. ← The turn to religion?